South Sudan peace partners on Sunday agreed to establish assembly sites for disengagement of the fighters. The deal was reached at Palm African Hotel in Juba. 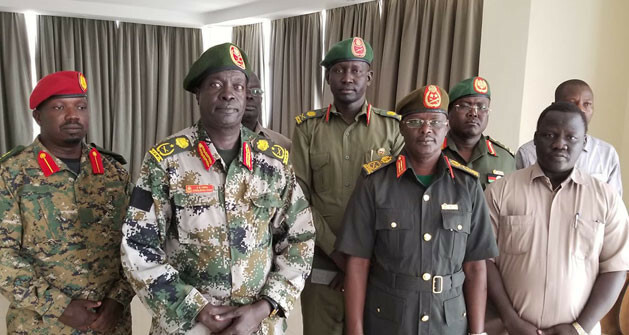 South Sudan army chief of staff, Gen. Gabriel Jok Riak signed the deal on behalf of government forces, Gen. James Koang Chuol on behalf of the Sudan People’s Liberation Army-In-Opposition (SPLA-IO) and Gen. Charles Machieng Kuol for South Sudan Opposition Alliance forces. The parties, in a statement extended to Radio Tamazuj, agreed to immediately commence cantonment of the opposition forces in 25 sites while the government forces will be cantoned in 10 main barracks in the country, with at least one for each phase. The deal, agreed by the Joint Defence Board (JDB), also provides for each cantonment site to be a barrack of no less than a battalion. Unity State, the deal says, will have three sites for opposition and four barracks for the government, two sites for the opposition in Western Equatoria and four barracks for government forces, three sites for opposition in Central Equatoria and seven barracks for government. According to the deal, the opposition will take three sites in Eastern Equatoria and government takes eight places while in Jonglei State, government and opposition take 15 and five sites respectively. On the other hand, government takes 23 sites and the opposition five in Upper Nile region, while in Bahr el Ghazal region, the opposition takes six places and the opposition was allocated three. Meanwhile, the deputy spokesperson for the SPLA-IO, Col. Lam Paul Gabriel said they are committed to the implementation of the transitional security arrangements as per the signed revitalized agreement on resolution of South Sudan’s conflict. “It is time for peace implementation not waging war,” said Lam. In September last year, South Sudanese arch-foes signed a revitalized peace agreement, aimed at ending the devastating civil war that killed tens of thousands of people and displaced millions.